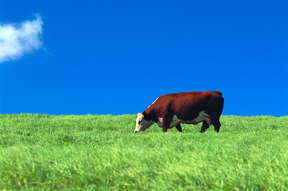 Can cows benefit from soybean feed and forage? Dr. Rebecca Atkinson, a beef nutritionist, is completing research on the effects of soybean forage. Atkinson has been discovering that soybean plants provide pretty much the same nutritional qualities as alfalfa. "This might be an alternative to extend the grazing season, and it could help growers through the summer slump when forage quality starts to decrease due to the lack of rainfall," stated Atkinson. Others areas Atkinson hopes to study include the effects on dairy cows of the plant estrogens in soybeans and the amount of flesh beef cattle produce when grazing on bean plants in addition to grass.